Crème brûlée is a very easy and decadent dessert. Don’t let the stories of making scrambled eggs scare you. Also, a torch is not necessary for this dish, this recipe uses the broiler. It is an easy make ahead dish and all you have to do is caramelize the sugar before serving. The egg whites can be used to make egg white omelets, such as, Chorizo, Onion, Tomato, Cilantro & Queso Fresco Egg White Omelet. In a medium sauce pan, heat cream and vanilla over medium low heat. Stir frequently until warm and vanilla has infused into the cream about 5 minutes. Do not boil. Let cool for about 15 minutes. Cream mixture won’t be completely cool, but slightly warm to the touch. Whisk periodically to prevent skin from forming on top. While cream is cooling, in a large bowl whisk egg yolks and ¼ cup of sugar until fully incorporated and doesn’t have a grainy texture. Whisk egg mixture periodically. After cream has cooled, slowly whisk in part of the cream mixture to the egg mixture and then gradually add the rest. Using 6 – 4 ounce ramekins, pour mixture through a fine sieve into ramekins about ¾ of the way up. Pouring through a fine sieve is important, because it will catch any lumps. Place ramekins into a cake pan. Pour water into pan to come up ¼ of the way up the ramekins. Bake in a preheated oven at 350 degrees for about 40 minutes. Let cool for an hour at room temperature and refrigerate. Refrigerate for at least 4 hours or over night. 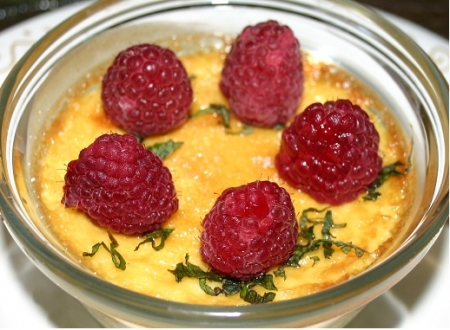 Before serving, remove ramekins and let stand at room temperature for about 10 minutes. Using a large cookie sheet lined with foil, place ramekins on sheet and evenly sprinkle 1 teaspoon of sugar over each dessert. Broil over high for about 1 minute. Check frequently for that one minute, because they can easily burn. Remove and let sit for about 10 minutes to cool. Garnish, serve and enjoy!